Nursing is such a huge part of my life. In two months I will have been nursing for three years straight. I can nurse in all of my clothes, I can nurse comfortably anywhere, and I can nurse super discretely–if I choose. I’m not embarrassed to nurse–not even while walking through the city–and I certainly don’t feel awkward nursing my kids. It’s just part of my day, like eating lunch. Back when Fae was brand new, I remember thinking about nursing. I’d plan ahead–nurse before going into the grocery store, before we had visitors, on a secluded bench in the mall. I was never sure how the public would respond and I wanted to avoid any bad looks. These days I’ll nurse anywhere without feeling the need to be super discrete. I’ve stopped considering what people will think because it’s become such a natural part of my day to me. I’ll nurse wherever I am, whenever I need to. I smile at people if they make eye contact, and I’ll often get a smile back. Maybe I’ve made some people uncomfortable without meaning to, but no one has ever told me that. And honestly, I don’t think people even care. Nursing is natural, and people know that. My daughter has apparently picked up on this. She also seems to be comfortable nursing her dolls and animals anywhere. And that makes me proud. 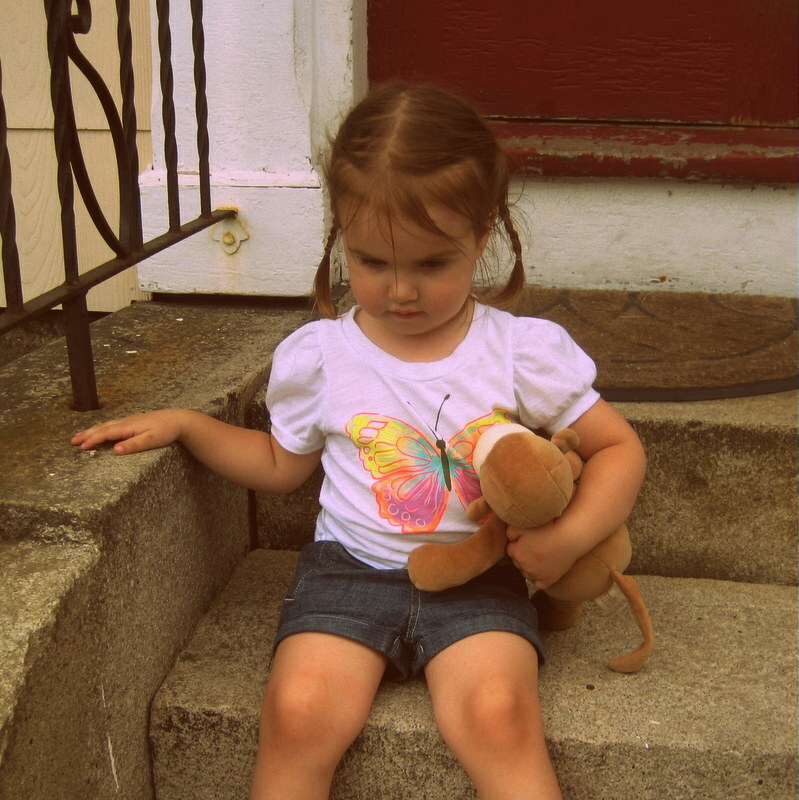 Fae, stopping to nurse her monkey. You know, it’s so nice to feel supported by other moms. I was nursing Hawk in the car the other day to calm him down and the woman in the next car glanced over and flashed my a huge I-totally-understand smile. It made me feel so understood. Sometimes you just don’t have the time to be really discrete. Oh, and don’t get me wrong. I don’t walk around downtown with by breast hanging out. I do cover-up a little when I’m out and about. At home though, when I take my nursing photos, I just nurse comfortably.